At King Edward Hotel I had a chance to photograph a few beautiful weddings and this photo was taken during one of them. The Vanity Fair ballroom at King Edward Hotel is an amazing wedding venue. The ballroom can easily accommodate 2-300 people and the hotel staff are just amazing! This photo was taken during the hora and I have to admit I love the dance! 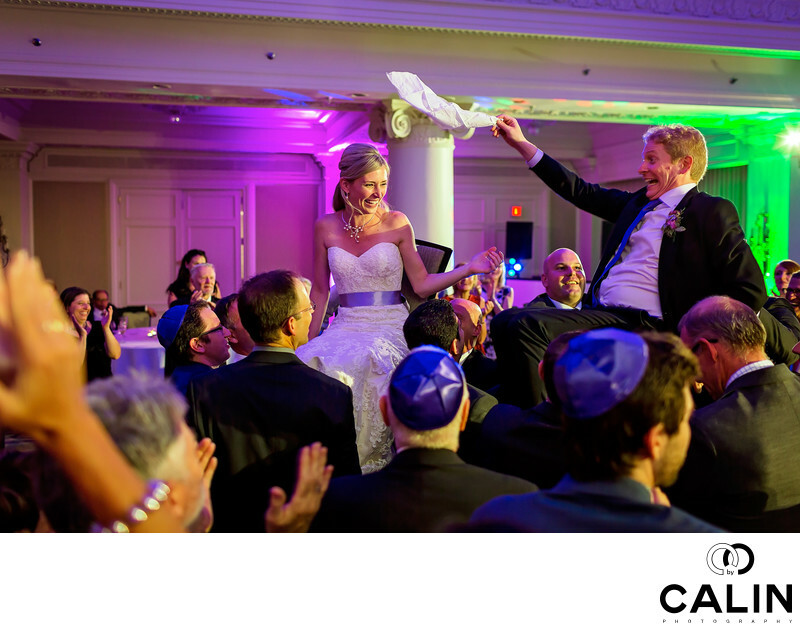 With Romanian origins, hora is that part of a Jewish wedding wedding where men lift the bride and groom, who are seated on chairs while everybody dances around them. The bride and groom are above everybody else and enjoy the music and the intense dances. The song that is usually played is Hava Nagila. During this Hora at this King Edward Hotel Wedding I was in the Vanity Fair ballroom and once I saw the bride and groom on the chairs I pulled a chair form a table and jumped on it to get a higher vantage point. I asked one of the guests if I can take her chair and she responded "OF COURSE! IT IS THE HORA!!!" The lady almost felt offended if I did not stand on a chair. The hora is THAT important. Now while hora is a perfect occasion for wedding photography, it is also a very dangerous dance for the bride, groom and the photographer. People move so fast and the emotions are so intense that there have been cases where people got hurt. A very common situation is for one of the dancers to fall and be stepped on by the dancing guests. This can lead to scary and hilarious situation. My advice for the bride and groom is to pick their chair bearers ahead of time and to do the hora before too much alcohol was consumed :-). The men who lift the chairs during a hora should be strong and sober!!! Make sure you pick solid chairs and by no means use folding chairs - those could be recipes for disaster. In this particular image, the groom is holding a handkerchief and laughing hysterically. His bride, is also enjoying the moment while the guests are looking at them. As a Toronto wedding photographer, I know the value of strong candid photography and whenever such opportunity presents itself, I take plenty of pictures. Especially during the hora, when everybody is energized by the rhythms of Hava Nagila, it is, for the guests to bump into me. As such I would rather take more pictures than necessary then go home and realize that I lost most of the moment because my pictures were autofocus as a result of the guests hitting me. In terms of composition, the bride and groom are positioned according to the rule of thirds along the two vertical guidelines. Also, the image has depth because in the foreground we see a multitude of guests, then in the middle ground we have the bride and groom. Finally, we can see more guests in the background observing the dance while seated. What I like the most in this image is the colour scheme. The orange tones of the tungsten light cast by the massive chandeliers in the Vanity Fair Hall and the human faces complement beautifully the blue kipoth worn by the male guests. Location: 37 King Street East, Toronto, ON M5C 1E9.